I am not a perfectionist. a collector who attempts to collect an example of every item in a particular field. How in the world does that relate to founding a software product? Or any product at all? What is it that I feel I need to collect to completion in order to be able to launch a product? Here’s a hint: it’s NOT the ability to “slap something together and ship it”. I’ve been analyzing business requirements, writing specs, and shipping code for 20 years now. I have THAT part down. If anything, I’ve shipped more “slapped together” code than my consulting clients would probably feel comfortable with. Sorry, clients! What I have been trying to collect to completion is product marketing knowledge. That’s what I felt I was lacking, and what I felt I had to master in its entirety before being able to give myself permission to launch something. “I don’t know enough to launch a product yet!” has been my mantra – or worse, “I don’t know anything yet!”, which is completely nuts. The More I Learn, The Less I Know…WTF?!? I’ll let you in on a little secret – despite the numerous books, blogs, videos, and podcast guests whose combined product-founding knowledge I’ve absorbed, I have been completely insecure about my own level of marketing know-how. I’ve been laboring under a sense that the more I learn, the less I feel like I know, and the less confident I feel about the knowledge I do have. Generally speaking, that’s the opposite of what happens when I learn about a given subject matter (for example, I never felt that way about programming). It’s weird, I didn’t like it, and I’m not sure why it was happening. For certain, I’ve learned a lot about product marketing. But it was never enough. Until recently, that is. I was having a conversation with a friend who suggested that perhaps my problem wasn’t that I knew too little. After all, she said, I seemed to demonstrate plenty of knowledge about what needed to be done when discussing the matter. Perhaps, suggested my friend, I was suffering from information overload? At first, this seemed nuts and sent me spinning off into existential BS – how could I possibly know too much? Can anybody really know too much? Is it even possible to know too much? My inner nerd was aghast at the thought. But What If it’s True? What Do I Do? The entire time I’ve been bemoaning the “fact” that I don’t know enough marketing tools to launch a product, I’ve been using marketing tools to promote an upcoming product. Arguably, I’ve been doing a weak, unfocused and ineffective job of it, but I have been doing it. And just like that – with a deep sigh of realization and relief – I gave myself permission to proceed. And proceed I did! 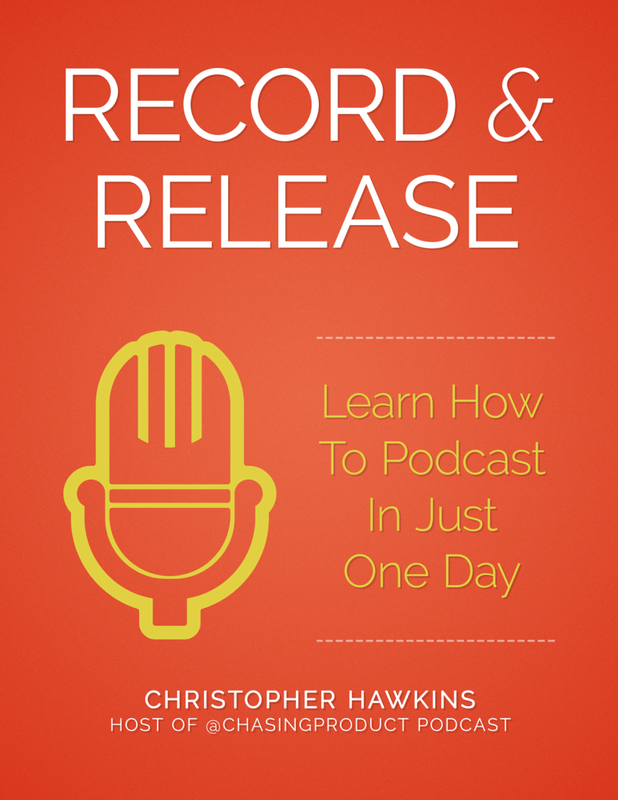 In order to actually get to launch, I spent the past 10 days putting my energy into a newly-slotted-at-#1-priority project, a book entitled RECORD & RELEASE: Learn How To Podcast In Just One Day. The book shipped on July 24, 3PM PST. How do I choose a show topic? How do I choose a name? What gear is “good enough” without being expensive? How do I set everything up? How do I get people to listen? And more! RECORD & RELEASE will not only answer all these questions, but is short enough that you can read the whole thing AND put all the pieces of a show together in just one day (if you have the hustle to do so). Similar online courses often start at $100 and go up from there – and they might even be worth it – but the book is only $29. SmallSpec is still a go, but has been re-slotted as my #2 priority project. The new prototype is almost ready for dogfooding. I’m letting someone else build it this time, and oddly, now that I have given myself permission to just use my existing knowledge to market it, I’m much less eager to push, push, push it out the door. But rest assured, once it’s been dogfooded for a few weeks, I’m going to toss it out on the web and let you fine folks either embrace it or rip it apart. The long & the short of it is, SmallSpec is tomorrow, RECORD & RELEASE is right now. I was able to launch a product faster, using the tools I already know, by shifting gears temporarily and doing a book. My Saas app…that’s still coming, just later.